Vinyl flooring and the newer category of luxury vinyl tiles and planks offer amazingly realistic looks at every price point. With resilient flooring, it’s all about choice. You’re sure to find a pattern that works with your decor and your budget. Once you’ve found your style, the next choice is the method of installation. Traditional sheet vinyl can be fully adhered, fiberglass backed floors can be loose laid, and our premium vinyl floor can be floated or glued. Durable enough to stand up to your busiest household traffic, these floors are also very easy to maintain. Luxury vinyl plank and tile performs best in wet environments. For that reason, it’s the perfect choice for basements, kitchens, laundry rooms, mudrooms and baths. But don’t stop there. It’s stylish enough to be used throughout the house. 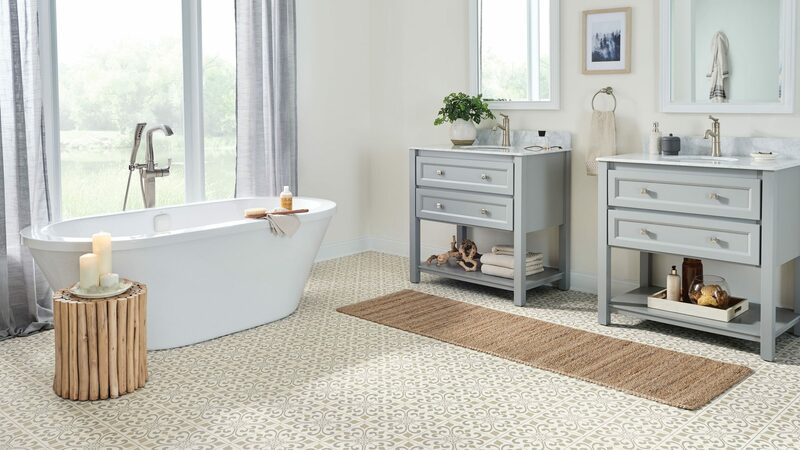 We’re proud to feature a premium groutable vinyl tile that’s a top performer in this category. It offers the look of stone, but is warmer, softer and quieter underfoot. If you love the look of wood, but need the performance of vinyl, you have to consider either fully adhered or new click together vinyl planks. 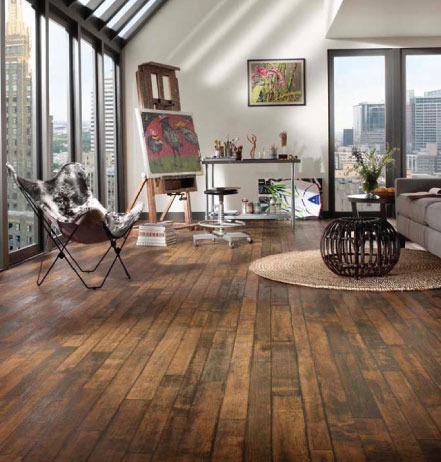 We take pride in offering the newest introductions in this exciting category of flooring. Design trends are always evolving, but the beauty of natural materials has lasting appeal. 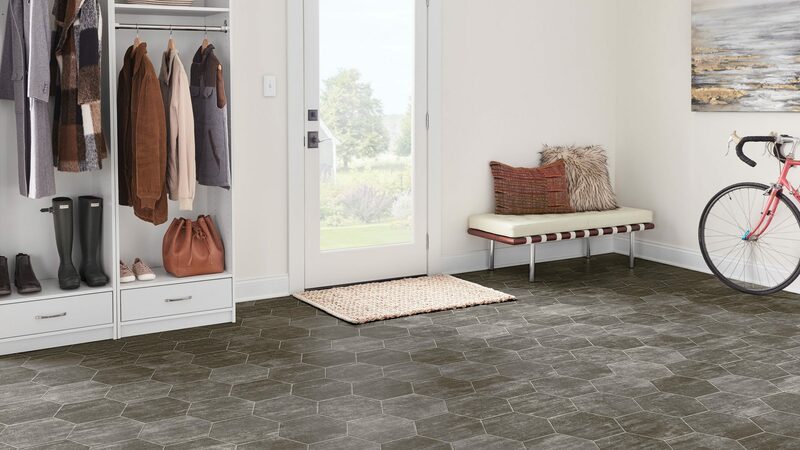 The natural beauty of stone is well represented in vinyl flooring. From small scale mosaics to large format slate looks set on a diagonal, you can get a thoroughly updated look that will stand the test of time. Versatile modular patterns with varying sized tiles work well in any size room. We love the beauty, warmth and charm of wood. 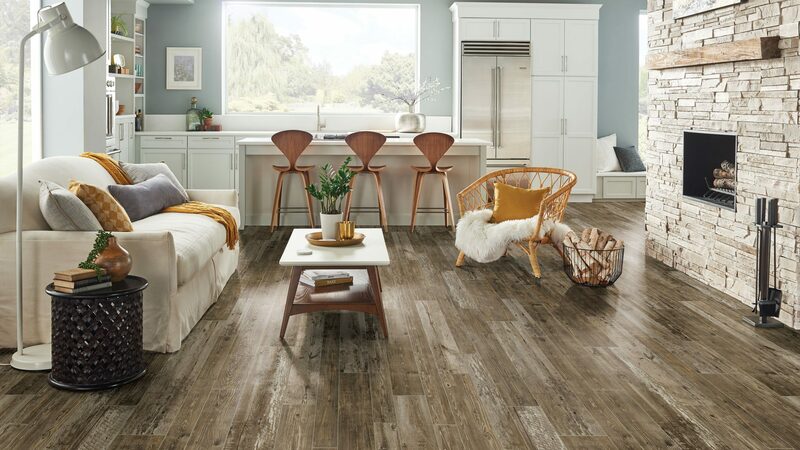 From chic and contemporary exotics to rustic handscraped looks, vinyl flooring has it covered. Luxury vinyl planks have the most realistic visuals and are sized to look like hardwood flooring. These styles are just right for the lower level family room. Great looking, resilient and so easy to clean. You can have it all -- the beauty of hardwood and the low maintenance of vinyl. If your style doesn't fit neatly into one category, neither will your floors. Alternatives are just that, an alternative to tile or wood looks. Overall patterns that mimic linen fabric or stained concrete with no lines keep it clean and simple. Embossed patterns like impressed leaves and metallics add texture and visual interest. These versatile styles can be used in all areas of your home.